This post is my first for the R.eaders I.mbibing P.eril VII event. That event celebrates reading of books ghastly or ghostly, and the book I am reviewing definitely has ghastly elements. And this describes Bernie Gunther’s journey. Accepting what he has to accept in life, trying to change what he can. In The One from the Other, Bernie Gunther is a private detective in post-war Germany. He is a former policeman who was in the military in the Great War and in World War II. He takes on some missing person cases with connections to ex-Nazis. Bad things happen. 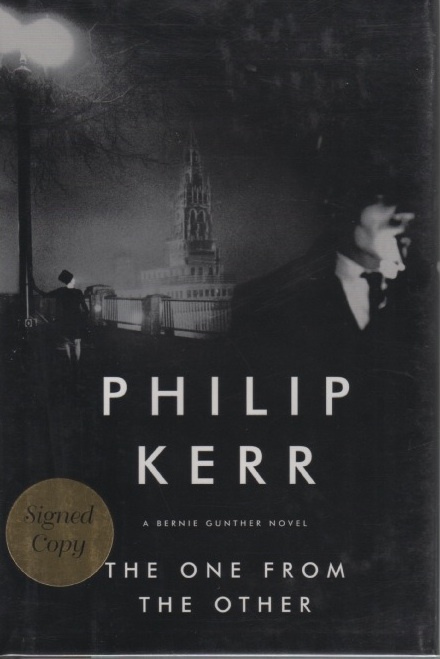 Gunther was the protagonist of three earlier books by Philip Kerr, published in 1989, 1990, and 1991. Together they were republished as a trilogy: Berlin Noir. I read those books six years ago. They were powerful, compelling reads. The first novel, March Violets, is set in 1936, and Gunther is retained by an industrialist to retrieve a stolen diamond necklace. I don't think I'm giving much away if I say that the investigation leads him into struggles between Nazi factions. The second, The Pale Criminal, is set two years later, and finds Gunther recalled to law enforcement by Reinhard Heydrich to the solve a string of murders of teenage girls. Here again, Gunther's investigation soon places him amidst political intrigue. The third, A German Requiem, finds Gunther summoned to Vienna in 1947 to assist with the defense of a pre-war colleague on trial for the murder of an American officer. 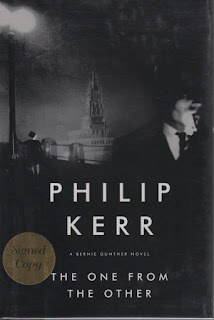 In The One from the Other, published in 2006, Gunther is now a private detective in Munich. Most of the work he finds is unappealing but he takes whatever jobs he can get to support himself. One of these jobs leads him into a situation where he is beaten severely. During his recovery, he is befriended by a doctor who allows him to recuperate in his home in Garmisch-Patenkirschen, a mountain resort town in Bavaria and home of the 1936 Winter Olympics. At this point things seem to get better, but not for long. Like the first three books, The One from the Other is written in the hard-boiled style of Raymond Chandler, told in first person narrative and loaded with similes. One reviewer noted that this lightens the tone of an otherwise very dark and gloomy novel, and I suppose it does, but not a lot. Germany before, during and after the war was a hard place to exist; it is difficult to read about the problems most people faced and the twisted, evil people who gained power in this environment. I liked everything about this book. The story, the setting, the portrayal of the characters. The overall feeling of the book is gloomy and resigned; the picture of Germany at the time is depressing. Nevertheless, it was a pleasure to read. The only thing I noticed is that for the first half of the book there is no murder and it seems more like a historical novel than a mystery. That would not be a problem for me anyway but the story definitely has mystery / thriller elements in the second half. Post-World War II Germany is portrayed in a very convincing way. The author has done thorough research in order to depict this time chillingly and authentically. This novel is more bleak than most I have read set in this period. As in many historical mysteries, the author inserts real characters from history: in this case Adolf Eichmann is the most prominent. I think this book could easily be read as a standalone, but the reader would enjoy the book more and have more understanding of the protagonist if the series was read in order. There are two reviews for this novel at Eurocrime. This one links to the second one. This page at a fan site has more description of the first three books and links to reviews. So glad you reviewed this as Kerr is an author that I had recommended to me before and had forgotten all about him. This and the others sound great. I need to remember this time around! And I will read them in order when I do read them. I prefer doing that when I can, unless it is some massive series like Pratchett's Discworld.